Which binoculars should you choose? To start with, you need to get to grips with the terminology. Binoculars are described by two figures, such as 10×50 (pronounced ‘ten by fifty’). The first figure is the magnification, which is 10× or ten times, and the second figure is the size of the objective lenses in millimetres. As with telescopes, the magnification depends on the eyepiece you use, though in the case of binoculars the eyepieces are not usually interchangeable. Magnifications are typically between 6 and 12 in everyday binoculars, though specialist binoculars may have magnifications of between 15 and 25 or even more. Invariably, as the magnification increases, the field of view goes down, though in the more costly models you can get a combination of a fairly wide field and a high magnification, within limits. Although the physical size of the binoculars isn’t affected by the magnification, in order to provide a bright image it is usual for the higher magnification binoculars to have larger lenses. Occasionally you will see zoom binoculars, with a range of magnifications. These are best avoided for astronomy, unless they are extremely expensive, because the optical configuration needed to provide the zoom mechanism is usually a compromise, and results in poor optical quality or a small field of view, or both. The mechanism is also likely to suffer from wear or get out of line. Some manufacturers are notorious for offering binoculars with small apertures and extreme magnification ranges, often by mail order. No serious astronomer would buy them, let’s just say that. So what’s best for astronomy? 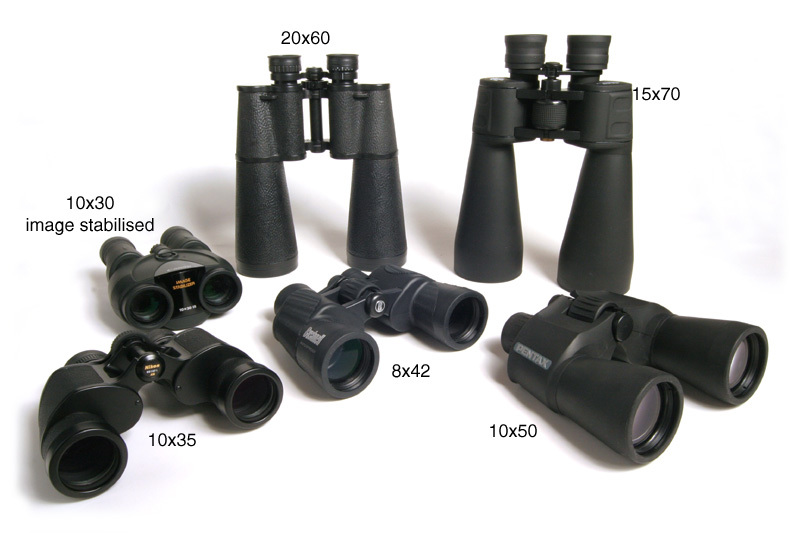 Here are some typical binocular sizes and their merits or demerits. 8×30 Lightweight and compact, easy to hold. 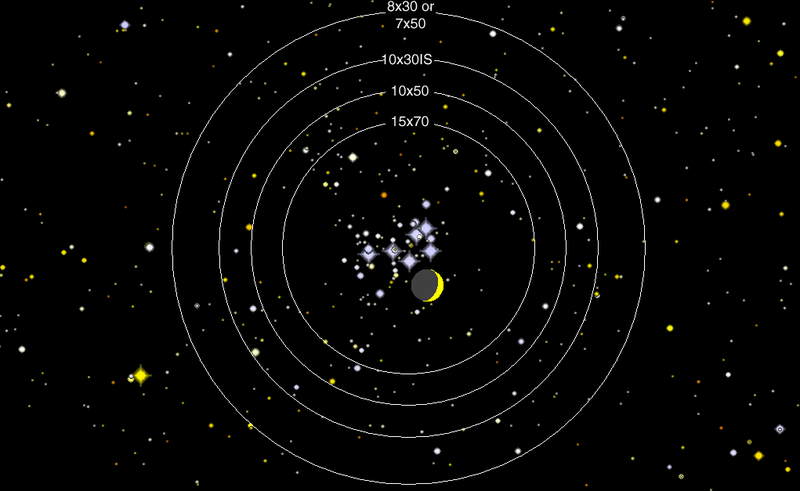 Wide field of view but limited value for astronomy because of the comparatively low magnification and image brightness. 8×42 Somewhat larger but still fairly lightweight. Brighter image than 8×30s. 10×42 Higher magnification allows better views of small objects than 8×42s, while still comparatively light. Good for finding constellations in light-polluted skies. 7×50 Very bright image and wide field of view and often regarded as a night binocular for military use. But older users (over 40) may not be able to see the full brightness of the image because their pupils don’t open wide enough (7 mm needed) to admit all the light. Excellent for viewing star fields and the larger nebulae, but rather heavy for many to hold gazing at the skies for long periods of time. 10×50 A good all-round binocular. The higher magnification than 7×50s means that the field of view is smaller but the higher magnification allows the smaller objects, such as some galaxies, to be seen more easily. Again, heavy to hold for long periods but regarded as the standard binocular for astronomy. Some galaxies, such as M51 and M81/M82 become easily visible in reasonable skies. 12×50 Same weight as other 50 mm binoculars but the higher power allows fainter and small objects to be seen at a cost of smaller field of view. With the higher powers, it can be harder to know which objects you are looking at, so some practice is needed. 15×70 These come into the category of specialist astronomy binoculars. The higher magnification and larger size give excellent views of a wide range of objects, and the fainter objects such as the Crab Nebula and galaxies in the Virgo Cluster now become easy to see. But they are pretty weighty and you wouldn’t want to hold them up for any length of time unless you have particularly strong arms. Some models are excellent value, but binoculars of this size and larger are less useful as general-purpose daytime binoculars unless they are tripod-mounted. 20×60 Equivalent to 15×70s in many ways – the higher power makes small objects such as galaxies visible, despite the smaller aperture. 25×105 Monster binoculars, requiring a tripod. Don’t get these as your only binoculars, but as luxury items they can give superb views of a range of deep-sky objects and can even show a little detail on Jupiter and the rings of Saturn.